"I am a children's writer living in Kent with my wonderful husband and two beautiful daughters. I have always loved writing and unlocking my overactive imagination. I finally began writing more seriously around six years ago. Besides my family, writing is my passion closely followed by reading, especially books by independently published authors. I also like to dabble in amateur dramatics." Anastasia bio: "Anastasia is a young girl who began her adventures at Boughton Lodge where she spent summers with her Aunt and Uncle. Her passion is horses and, as a young girl, she spent every waking moment with the horses of Boughton Lodge. Deciding there was too much crime in the world spurred Anastasia to become a detective which she is rather good at. As she has grown up she has found herself working to stop bigger crimes. Her ambition is to become a leader in the world of fashion and to be a world class jockey." "I was a mathematics teacher but always wanted to write Children's Stories. I found Rachael Phillips by chance on a Freelancers site and we hit it off and teamed up together. 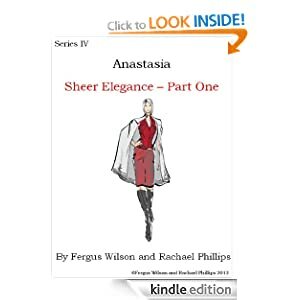 We have now written three Series' of Anastasia with number four coming up shortly. We are currently working on Larry the Liger. His father is a Lion, his mother a Tiger. I found Series III emotionally draining. It is the most fulfilling work I have ever worked on. I have contributed dialogue and Rachael has polished it so well into the finished product. I doubt wether we will ever surpass Series III but who knows."